Each of those prices are with a kit lens. This is classic Nikon. In the consumer realm, we find very small price bumps, which allows for lots of up-selling (and down-selling, if necessary). The exact plot comes very close to y = 74.405x^2 - 3.04.17x + 771.42, a polynomial curve. I wouldn't be surprised to find that Nikon has a very specific curve they try to hit. At the moment, the FX cost is US$900 (the D7100 and D600 are basically the same body with only DX versus FX differences). 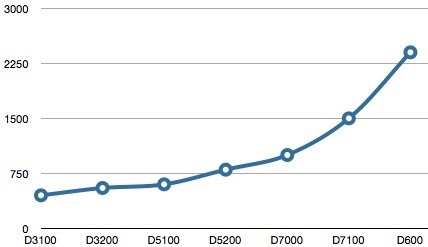 Also at the moment the new generation cost ranges from 18% (D3200) to 33% (D7100). This is the first time I can remember where we've had the full previous generation of consumer cameras still readily available simultaneously so long after their launches. Both the D3100 and D7000 were launched in fall 2010, and the D3200, D5200, and D7100 are 13 months, 5 months, and 3 months old, respectively. One reason Nikon may be stretching the DX DSLR announcements is simply because of built-up inventory they need to sell off. With the yen now down 30% and DSLR sales trends downward, here in the US I expect that by the end of summer we're going to see a very different situation in pricing. Either this curve moves downward, or the previous generation cameras start falling more below the curve; maybe both.